Happy Friday, blog friends! I hope your Friday is going better than mine. I’ve already spilt burning hot coffee on my newly washed jeans and my photo editor isn’t working, which means these photos are going to be dark, ugly and mismatching since they are from 2 different shoots. As Liz Lemon would say, Blurg! ANYWAYS! Yesterday, I teased you with the promise of some ginger lime noodles to go with your green beans and bamboo shoot stir-fry. I’m delivering as promised! Drain and press tofu. (I used my Tofu Press, which I’m addicted to, and pressed the tofu overnight). Dice the tofu into desired size. Combine 2 TBS olive oil, 1 clove garlic, 1/2 tsp freshly grated ginger, zest from one lime, juice from one lime and 1/2 TBS of soy sauce and whisk together. Combine the marinade and tofu in a ziplock bag and marinade for 2-24 hours. 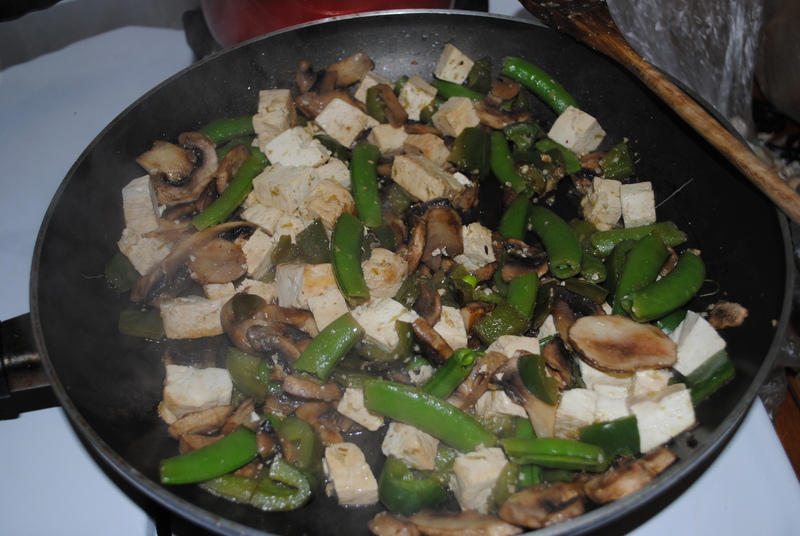 Once the tofu is marinated, heat a skillet on medium heat and add olive oil. 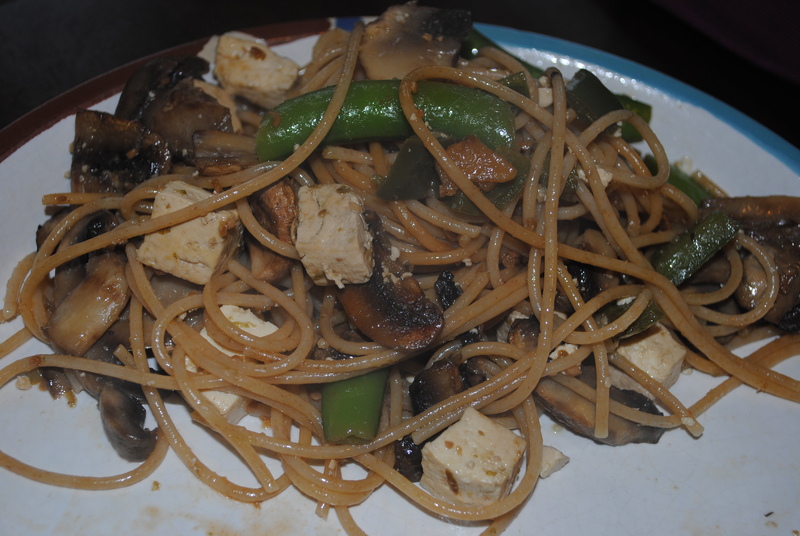 Add peppers, mushrooms and tofu to the pan and saute for about 6-8 minutes (the tofu can really be added anytime but I like to add it in the beginning so it picks up all the veggy taste). While peppers, mushrooms and tofu are sauteing, bring pasta water to a boil and cook according to directions, draining and set aside. You can also begin the sauce. My one problem with veganizing this recipe is that the tofu acted as a big sponge, absorbing all the yummy marinade and sauce and leaving the dish kind of dry. While the veggies and tofu are sauteing and the water is boiling, add the rest of your marinade/sauce ingredients (2 TBS olive oil, 1 clove garlic, 1/2 tsp freshly grated ginger, zest from one lime, juice from one lime and 1/2 TBS of soy sauce) to a small sauce pan. Heat on low. You don’t want it to cook down too much. You just want all those flavors to blend together. 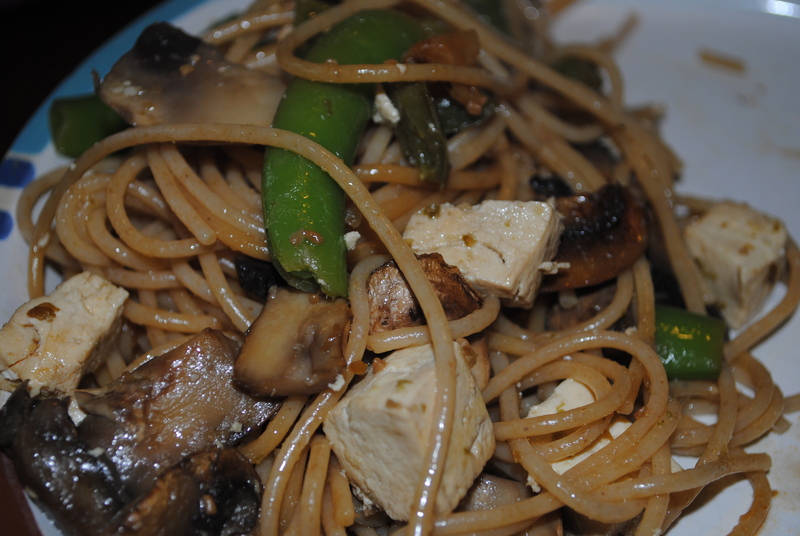 After the peppers, mushrooms and tofu have sautéed for 6-8 minutes, add garlic and stir for 30 seconds. Add snap peas, pasta and sauce and mix thoroughly. This recipe is actually modified from one that was posted on Howsweeteats.com. Confession: I have a serious blog crush on Jessica from Howsweeteats.com. Even though 99.9% of her recipes aren’t vegan friendly and contain bacon in some way, shape or form, I still adore her website. It’s like my little guilty pleasure in the morning. I go on and drool over all the pretty pictures and get inspired on all the ways I can veganize her meals! Also, she’s hysterical. So there’s that too. Go check out her site… And make this yummy pasta for dinner this weekend! howsweeteats.com has it with shrimp, which sounds really good too!